Was I in for a culture shock? 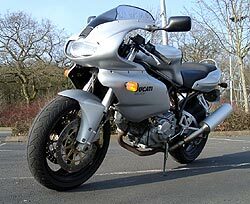 I thought so when I was presented with the latest 2003 Ducati 620 Sport after just returning from testing the latest 999 and a new ST4S! There I was standing in front of a spartan motorcycle which at first glance looked as if it had just been re-born from the 70's. With its half fairing, traditional Desmo L Twin engine, slim frame, even slimmer tyres and fairly solid suspension (better than last year though) I really thought I was in for a trip down memory lane! The little 620 Sport had only done 140 miles and was tight as hell! It felt like it the minute I started to ride it away, with its somewhat stiff 5 speed gearbox and hard pull clutch I was not looking forward to living with this bike for the next week or so. The first ride was mainly on dual carriageways and motorway for about 80 miles so we had a little time to get aquainted and to get a few straight miles under its belt. Surprisingly even with now just about 250 miles on it it was beginning to feel a little better on acceleration and the motor was beginning its first stages of loosening up, a few more miles and it should be ok for a through test session. 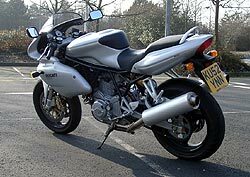 Having ridden back mainly on motorway I got a good chance to test the cruise-ability and comfort factor of this smallest of Ducatis. My initial feeling was that it would be hard work to keep it up to speed and that I would get aches and pains in places that usually I don't, this was proven wrong even on my first ride. The main thing that got me thinking about discomfort was the seating position in relation to the height of the bars. Usually the bar level and seat height is horizontally level if you look at most modern sportsbikes, on this Ducati Sport the bars are in fact below the seat level (like a race bike) and this would usually make for severe wrist strain. This was not the case to my surprise, it was in fact quite comfortable even though the seat was high. As regards the suspension it was somewhat stiff in comparison to most Japanese bikes but was yet to be tested to the full on ordinary roads. The 620 Sport is fitted with an upgraded Marelli injection for this year, and it really shows with the smoothness of the motor and the seemless progression of acceleration. No flat spots, no hesitation, a really well sorted injection system which many other manufacturers could learn a lot from. The motor has had quite a few changes made to it for 2003 and power has been increased to 61bhp and the torque is now up to 54Nm. This has been acheived by a combination of valve work, airbox expansion, exhaust retuning and lengthening of the stroke. The suspension has also been upgraded by the fitting of USD 43mm Marzocch forks and a rear Sachs adjustable unit. These modifications really make a difference to the way this little Ducati rides, although a fairly harsh ride it is a significant improvement on last years bike. Looking at the bike or riding it, all concessions to practicality are painfully obvious. The immortal foundation, however, remains. A triangulated steel trellis frame, born on the celebrated early '80s red-and-yellow Squadra Corse works racers, and this shows in the fact that the Ducati's best qualities are evident in motion. Make the longish reach to the bar and push the red button and the digital fuel injection triggers an unfairly muted desmodromic exhaust note, fit a pair of decent end cans and you will gain an extra 10bhp mentally! On the practical side fuel delivery is seamless, the clutch (spinning in oil instead of air) although stiff at first was now getting a lot better (or was I getting used to it? ), and the gearbox (a little rigid at first) was beginning to smooth change though the five-speeds nicely as you approach 500miles. 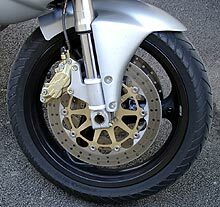 With relatively tall gearing and not much horsepower below 5000 rpm, firm suspension and moderately cruel ergonomics, town miles involve a little more discomfort than usual for a sports bike, but adjourn to the open roads and the long gearing drops the twin into a relaxed state of mind at anything less than 90 mph! With great fuel economy from the 16lt tank you will get around 180 miles on a tankfull, if you can stay on it for that long! Initially the seat provides no real comfort at all, but after a few hundred miles it tends to soften mercifully, only then will you be able to ride it through the tankfull! Our bike was noticeably revvier with 500+ miles on the clock than it was right out of the box, spin up between 5000 and 8250 rpm and the difference in performance from a few days earlier was very noticable. You don't need an alibi for not riding the 620Sport in town, it simply does its best job out on the twisty open roads. The slim, 160/60-17 section rear tyre sticks well with the overall weight of the bike (181kg) , and the steering, although heavier than most Japanese 600's is more precise. The chassis mostly ignores any attempt at midcorner countersteering, it's better to shift your weight rather than try to tighten your line. Slowing down though is no drama for the Sport as it is now fitted with twin Brembo Gold series 320mm discs with 4 piston calipers, a real improvement over the previous single disc model. With good feed back and progressive braking you can reduce speed with little effort. Smooth flowing roads transform the Sport into a scalpel in the hands of a good rider, it steers well and has train-like stability on almost any corner. There are no nasty scraping sounds at insane lean angles and the sheer speed you can carry with this bike showed well in a chase by a GSXR1000 on my favourite road. Needless to say that he had a hard time keeping up (well not on the straight bits!) on most corners. With all it's quirky little traits and lowish power output logic says go for something like an SV650 as your first real sportsbike, I say try one of these with a few miles on it, you won't be dissapointed! Beginners may well have a little difficulty adapting to the Sport's quirks, and experts will want more performance than it can deliver, but after riding one of these and getting to know it you will be ready for the next step far more than most. If you suffer from a little shortness in the leg then go for the Monster 620 with it's low seat height, whichever you decide on you will get a real motorcycle with a bit of class and a lot of Italian style. Collecting the 620SS brought back a load of memories for me. One of the last Ducatis I owned, a long time ago, was a 600 Pantah, and the 620SS is, in a very real sense, a direct descendant of that bike. 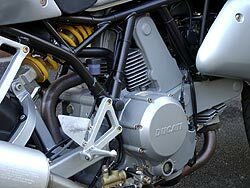 The Pantah introduced to the world the idea of belt driven cams, oil level sight glasses and something approaching mechanical reliability in an engine with Ducati stamped on the cases. That same engine, albeit slightly overbored and fitted with fuel injection, lives on in the SS and Monster range. Something else that soon seemed familiar as well. The Pantah was blessed with suspension that conformed with the 80's idea of fine handling - make it as rigid as you can while still absorbing bumps. Well, slightly, anyway. The SS is blessed with a totally unadjustable suspension setup which is almost totally non compliant when it comes to surface irregularities. It's also got a very similar riding position. In fact, riding this bike was a little like experiencing a time-warp. Funny thing is, though, that although the 620SS felt almost exactly like riding a well set up 1983 600 Pantah, that is absolutely not a criticism. I remember the Pantah was a good bike - I raced one in F2 for a while and it always did me fine - but I really expected the little SS to feel slow and primitive. That it doesn't is a testament to an extremely good design that has been sympathetically modernised. That rock hard suspension is actually surprisingly effective and the venerable engine churns out lovely big dollops of torque right where you want it without threatening to overwhelm the back tyre. I'd be less than totally honest if I said that the 620SS was enormously comfortable. But then again, it isn't uncomfortable either, and compared to more extreme tackle on offer it's a veritable armchair. I'd also be deceiving you if I said that it was blindingly fast. But it has plenty of accessible, real-world power and gives larger, far more powerful bikes a fair run for the money. I'd say Ducati have pulled off a pretty neat trick here. While I don't think even they would deny the fact that the suspension comes from the bargain bin and the basic design is at least 20 years old, the 620SS manages to handle outstandingly well and go far better than it has any right to. The last facelift has left it looking pretty smart, it has that name on the tank, it's competitively priced and it is, in most ways, completely unthreatening. Until this test I could only recommend one first big bike. Funnily enough, it is also a vee twin of a similar capacity. Now there are two. I can honestly say that I cannot think of a better first sports bike. And that's not something you'll hear me say very often. 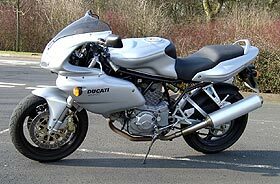 Read external Ducati 620 Sport reviews on Ciao.